Sometimes, the most seeming disorganized event can be the pearl in the oyster when it comes to images. 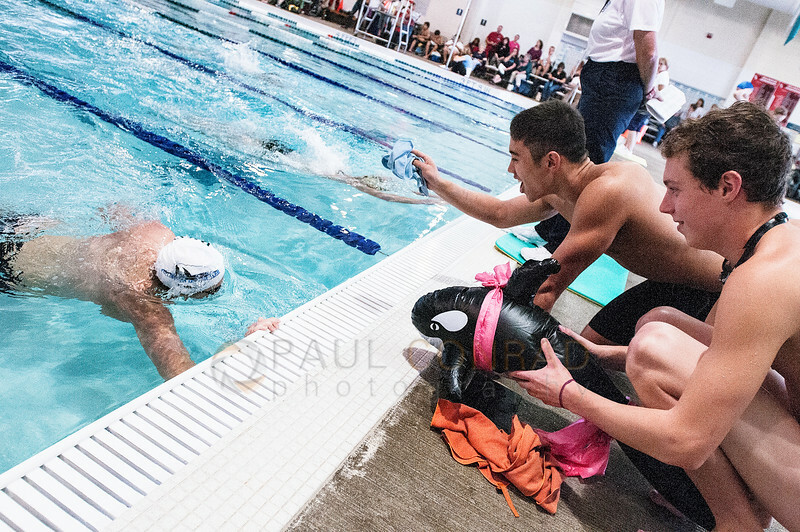 Case in point, the 2014 October Challenge Swim Meet in Bellingham, Wash., at the Arne Hanna Aquatic Center on Saturday Oct. 11th. 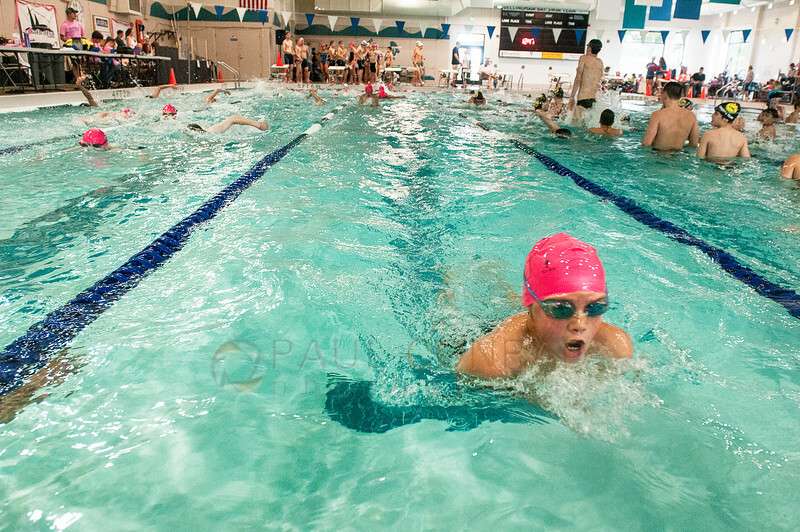 The Bellingham Bay Swim Team sponsored meet featured over 300 swimmers in five teams from the Pacific Northwest. Swimmers in high school and below competed in many different events. 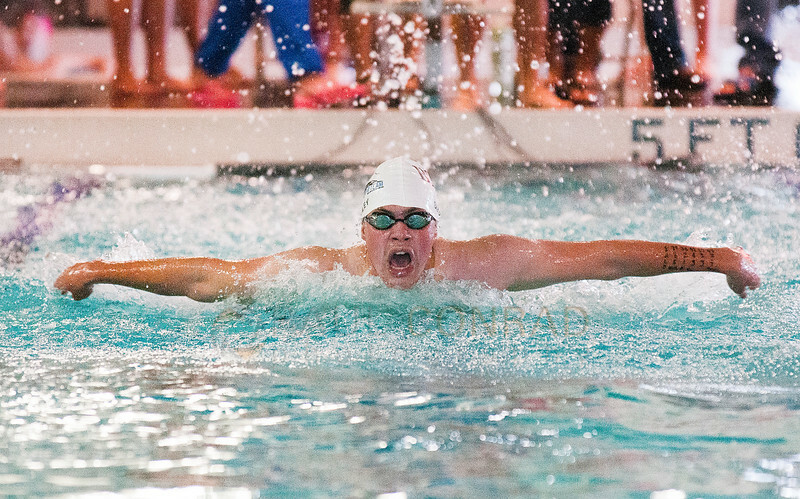 © Paul Conrad/The Bellingham Herald – Cole Avery, 17, of Bellingham, Wash., competes in the 200 yard butterfly during the 2014 October Challenge swimming competition at Arne Hanna Aquatic Center in Bellingham on Saturday afternoon Oct. 11, 2014. Avery ended with a time of 1:57.16 winning the event. The first thing I did was find and introduce myself to one of the hosting coaches. It’s a good idea to let them know you’re there and shooting. Make sure you get a roster and list of events from the coach. You need to keep track of the races you shoot and the competitors names. © Paul Conrad/The Bellingham Herald – Swimmers warm up during the 2014 October Challenge swimming competition at Arne Hanna Aquatic Center in Bellingham, Wash.
What I usually do is take a photo of the scoring board before the event starts so I know what event and heat number is competing. Then I focus on the faster swimmers to see who is more aggressive. Those are the ones that will get you a good facial expression as they are trying harder. © Paul Conrad/The Bellingham Herald – Rowan King, 15, of Bellingham, competes in the 200 yard breaststroke during the 2014 October Challenge swimming competition at Arne Hanna Aquatic Center in Bellingham, Wash.
As I shot, I circled the name of the competitor I concentrated on then verified the name with the coach when I had a few moments. I also shot the scoring board after each event to get the time. And then when it switched I shot another. Doing that bookmarked the series of images so I could get the correct identity of the event and swimmer. Get Low: Don’t be afraid to get a little wet. Lay down at the edge of the pool where the swimmers turn around. Laying down gives you a better angle to capture the faces as they swim. Except the backstroke swimmers. Protect Your Gear: This may sound like common sense but keep your camera bag and extra gear to the side away from the pool and away from the swimmers. Make sure your bag is closed. I inadvertently left mine open and a swimmer who had just finished, began to drip water in it. They were unaware. Luckily, just a few drops made it in. But keep it closed, covered, and on a shelf away from spectators and swimmers. 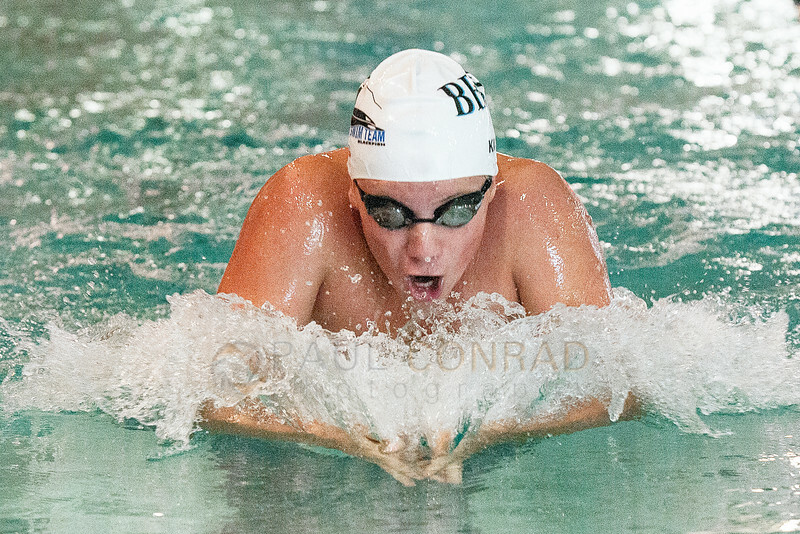 © Paul Conrad/The Bellingham Herald – Rowan King, 15, of Bellingham, Wash., comes out of the water as he competes in the 200 yard breaststroke. White Balance: Due to the fluctuating color balance, like in High School football stadiums, leave set it to automatic. This is to get a more correct exposure meter reading and make it easier to keep your colors “accurate” during your workflow. When shooting, you’ll notice the color change frame to frame as you scroll through your images. Exposure. Most my images were exposed about 1/3 to 2/3 under. I wanted a fast shutter speed and the pool was dark. It was cloudy out and the windows are on the north side of the pool so it doesn’t get direct sun. So to keep a reasonably fast shutter, I underexposed a touch. 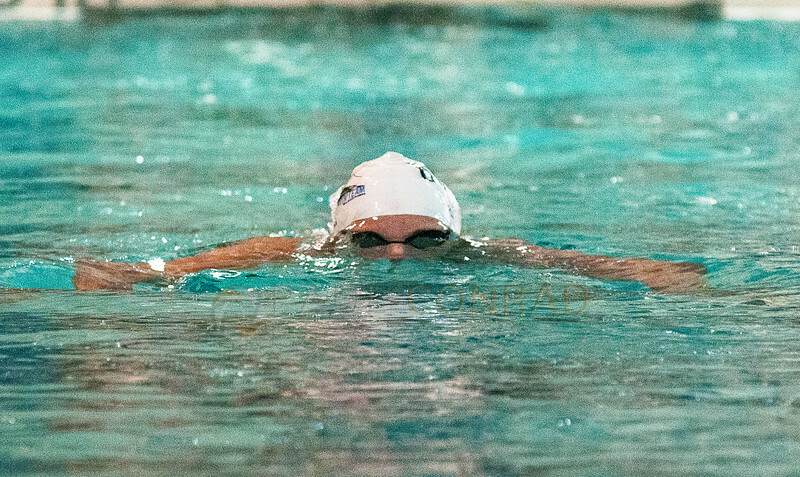 © Paul Conrad/The Bellingham Herald – McKenzie Pham with the Bellingham Bay Swim Team competes in the 200 yard backstroke. Aperture: Keep it around f/4. You want a little depth of field but not too much as you want to keep your shutter speed fast. But don’t forget to get creative and play with slow shutter speeds. Lenses: I used both my 80-200 and 17-35. The wider focal lengths for features and the longer for competition shots. With the exception of a few shots when I first arrived, I avoided using the wide lens as that meant getting close to the pool and increasing the chance my gear will get splashed. ****** Waterproof Housing: Although I wanted to, I was not able to use my underwater housing. I have a Ewa Marine U-BFZ100 that I like to take so I can get a few underwater shots. However, as the officials don’t allow being in the pool, usually I lay on my belly, and stick the camera as far down into the water as possible. But the design of the pool dictates that and this pool’s sides were not conducive. 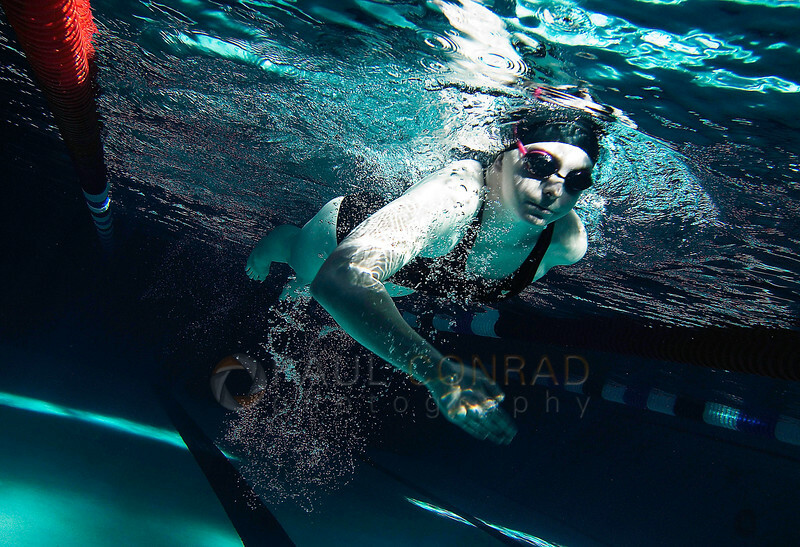 © Paul Conrad/Pablo Conrad Photography – Aspen High freshman Keely Roberts approaches the middle of her 6th lap during the 500 yard freestyle of the Tri-Met at the Aspen Recreation Center in Aspen. Roberts won with a time of 6:53.13. Thank you for stopping by to read and view my work. Feel free to comment, critique, and just ask questions.